Although this video (warning: graphic content) is from 2014, and sadly the SAFE Act mentioned in it did not pass, it is nonetheless just as relevant today. Thankfully, a new version of this legislation exists in the form of the revised 2015 SAFE Act, H.R. 1942/S. 1214. Every year, approximately 180,000 American horses are slaughtered for human consumption. They are transported across the border to large slaughter facilities in Mexico and Canada and their meat is exported to Italy, Belgium, France and Japan. 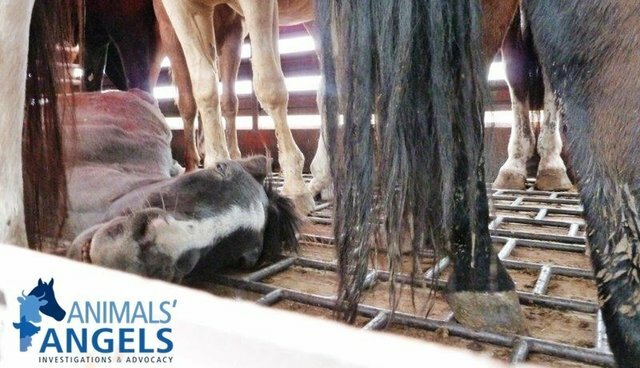 For years Animals' Angels has been at the forefront of efforts to stop the horse slaughter industry from every angle possible. According to Sonja Meadows, founder of Animals' Angels, "The whole process behind the horse slaughter industry is mostly hidden. If people knew, they would be outraged. It is the goal of Animals' Angels to raise awareness among the general public regarding this predatory and abusive industry. I think if people knew, more would get involved and pressure Congress. Right now, only horse enthusiasts are contacting Congress to pass the SAFE Act." Hoofbeats of Horror (warning: graphic content), with footage taken straight from Animals' Angels investigations, gives a realistic and accurate view of what happens to horses in the slaughter pipeline and it shows just why it is so imperative that legislation is passed to protect these majestic animals. No horse deserves the horrific fate shown in this video. We must all stand together and be a strong, united voice for the voiceless and pressure our representatives to get behind this current legislation. Please consider making a donation to Animals' Angels so we can continue our much needed work against horse slaughter. To learn more about Animals' Angels, please visit our website.